This TPA graphic shows how Council Tax forms a bigger bill than income tax, and second only to VAT, from the bills sent to residents at the lower end of the income spectrum. It’s pretty expensive – even in the cheapest Borough for council tax in the UK outside a few London Boroughs. In the bottom decile, Council Tax typically* takes 7.2% of income away – for every £20, that’s £1.44 gone! 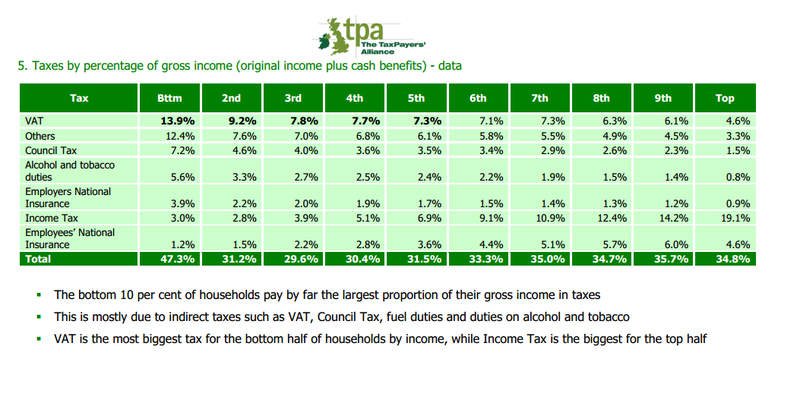 In the next, 4.6%, and in the next, 4.0% – just a bit more than people pay in income tax at 3.9%…. Council tax is a pretty regressive tax, linked to property size rather than income levels, so keeping it as low as possible really does make a difference for those on lower wages or fixed incomes such as pensioners – whilst delivering excellent services, that remains our aim for 2015! 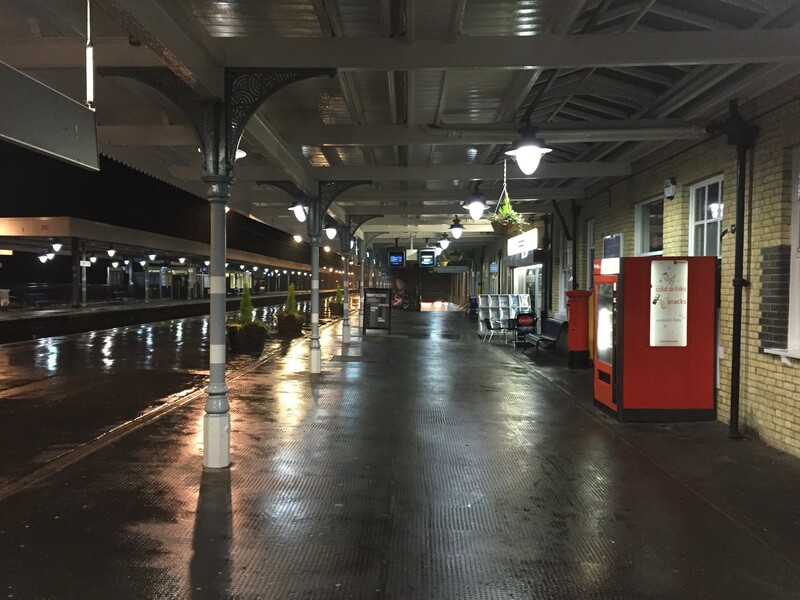 This is my last blog of the year as I will be taking the next week or so off to spend time with my family and friends as we celebrate Christmas and the New Year and also to reflect on what’s been a challenging year. 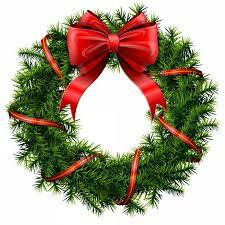 In my family life it’s the year we lost my mum after her long battle with cancer and so this Christmas will be so very different and she is dearly missed by us all. In politics it’s the year that one of the councils I am a member of, really started to motor with shared services and proved that you can cuts costs substantially and delivery just as good a service. At the other, well…it’s the year I finally lost my cool at the mistakes and being constantly blocked on the things I know we have to do, and thus got purged for my troubles. The coming year will certainly be interesting with the District and General Elections and hopefully new opportunities! Christmas is a wonderful time of year but please spare a thought for some of those less fortunate than yourselves as it can be a lonely time of year as well, things as simple as a card through the door or a chat on the phone could be the difference for some people, so please do think of older neighbours and wish them a Merry Christmas. It just leaves me to thank you if you’ve been kind enough to read this my blog, much appreciated, you are a hardly sole! Merry Christmas and a very Happy New Year to you and your family. A couple of Friday’s ago I attended the East of England Assembly of Council Leaders representing both Forest Heath District Council and St. Edmundsbury Borough Council as neither Leader was able to be there due to prior commitments, held at South Cambridgeshire’s District Councils offices in Camborne, I always go for a little drive around Camborne because as a new entirely village it is interesting to see its development from the site boards & sales Portacabin of a few years ago, into the thriving community it is today. Attending for the first time was the new Chairman of the LGA Cllr. David Sparks who took over from the Conservative Sir Merrick Cockell, it was interesting how he spoke about Devolution being as heavily involved as he is in a City Region Bid for new powers. 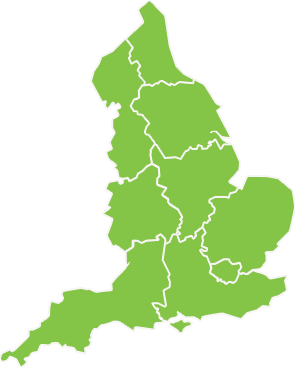 It was clear from all in the room that whoever wins the next election that we need to come up with an ask based on some form of East Anglian, the trouble is I think we’ll struggle to agree what this looks like before the great political ‘gold rush’ that many of us think is coming. I say gold rush because un-doubtable those regions with a defined view will secure the ability to have a greater sense of devolution of power than those areas that do not. The day before the meeting Ed Balls was speaking in Norwich and spoke of a region based around Norfolk, Suffolk and Cambridgeshire and it was interesting to hear what people thought of that!, not least because he does not make off the cuff remarks and clearly Labour have a regional agenda and probably plan. As usual grand schemes whereas the Conservatives are quietly allowing Local Government to reorganise itself to best suit local circumstances, grand plans v pragmatic approaches, oh hum nothing changes! Next up was Phillip Colligan the Deputy Chief Executive and Executive Director of NESTA who went through some of the fascinating initiatives his organisation is leading on, Suffolk got a mention about the mutuals it created around Adult care services and I was quietly chuffed at those as I politically lead on them. I have followed with interest the work of NESTA since its inception and some of the pilot initiatives he talked about relating to volunteering in Hospitals and how to reduce unplanned admissions into hospitals for elderly people were things I shall be following up on to seem how we might replicate those across the wider system. A fascinating morning to represent West Suffolk at. A day at the Cricket – not! A couple of Thursday’s ago it was up to London again for a visit to The Long Room at the Famous Oval Cricket Ground and more importantly a morning meeting of the BCC group of TLAP, BCC stands for Building Community Capacity where I represent the LGA. At Lunch time we joined the NCAG (Nation Co-Production Advisor Group) who were having a day’s workshop on their vision for the future of care services co-production. At lunch I got catting with Janet Brandish who is training officer for a Charity in Norwich called Opening Doors and is the Co- Chair of NCAG, we discussed Norwich and its MP Chloe Smith who I said I used to work with as her Association Chairman and Janet spoke about access to benefits and the difference between those who can work, those who are unable to work and the work shy. I also meet with Alan who cares for his Daughter who has Learning and Physical disabilities, he spoke of the importance of the Day care and respite care she receives and its importance to her life. Janet was keen for me to read the Sir Stephen Bubb, Chief Executive of ACEVO and author of the independent report into the shocking abuse at the NHS Winterbourne View Care Home written in Easy Read on her tablet explaining what it means for those with physical and learning disabilities. Really interesting and well worth looking on http://www.england.nhs.uk to have a read. Also on the table was Marjory Broughton from SEEFA – South East England Forum on Ageing. As I was reading Janet’s Tablet, Marjory spoke about the importance of technology in keeping people in touch and I mentioned the Dragon Den I had been involved in for EELGA earlier in the year and that the winning bid was from a company looking to make an easy use tablet system for older people. 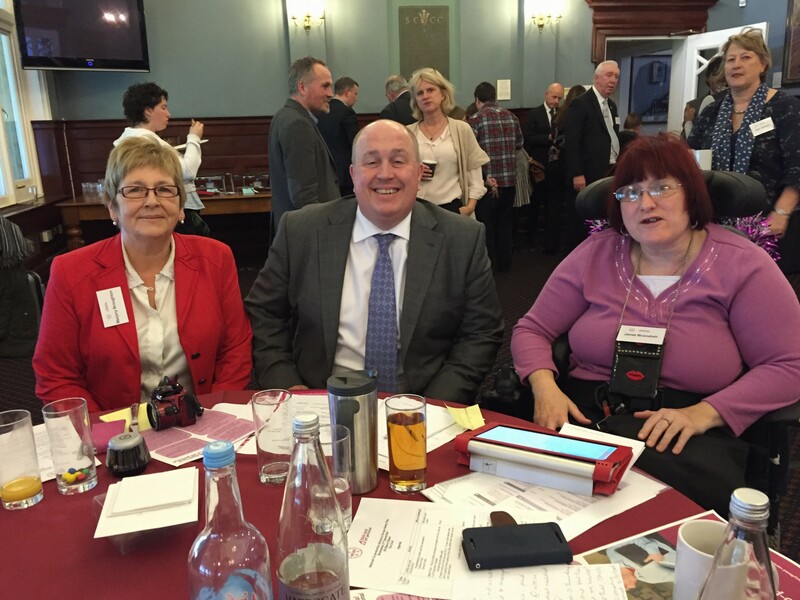 She kindly invited me to a House of Lords Symposium called ‘Transforming not Excluding, the impact of information technology and innovation on later life’ taking place in January and she invited me along which I look forward to. In the afternoon, I continued the conversation with Marjory as we both attended the TLAP Board meeting, discussing aspects of the programmes delivery. As I sat there at lunch time talking with Alan I said it was great that he was giving back to the system and sitting on NCAG to help shape the national approach and it struck me that for all the Board meeting, workshops, lobbying, Conference, and asks of Government on this table were two people who lives are profoundly affected by budget decisions in Government and Councils and that is why they need a strong voice to make their views heard. Continuing Problems, new thinking required! A few Friday’s ago I had the opportunity to attend a morning at West Suffolk House with David Hall from the Ideas Centre Limited who talked about and then lead a workshop on how to think differently in problem solving. 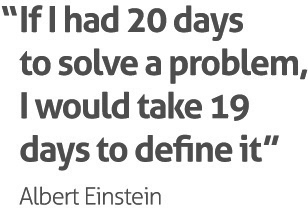 I enjoy these sessions as they are a blue sky thinking opportunity to use different tools and techniques to see problems from different angles and how to then find new ways of thinking about them that are often not apparent when you are right up against the intractable problems on a day to day basis. The morning was most timely as that afternoon I travelled to Cambridge for a meeting of the EELAG’s (East of England Local Government Association) Improvement and Development Panel of which I am a member and we pondered the coming Autumn Statement from the Chancellor of the Exchequer George Osborne and how, over the next few years, it will be those Councils who look at their issues from new and different perspectives that will flourish. Those who do not innovate and simply salami their way thought the cuts Agenda that will prevail until at least until the 2020s will have missed a considerable opportunity to have an open and honest debate with resident as to which services they value and wish to keep and which can simply slip away as being of a different era. If the last few council elections have been about council tax track records and future pledges, as important as such things are to the vast majority of residents, cuts in services are inevitable however well organised, stream line and cost efficient a council is. So how you go about cuts in one service whilst protecting another is vital, not only to make the right decisions and be proportionate but to take residents with you. Those councils that simply plough on cutting services as they go with the fig leaf of ‘Statutory Public Consultation’ will see the ruling parties sweep aside and lose control as people become more dissatisfied with their councils. Seems to me those in control now who survive will be those that actually co-produce changes with their residents, someone one said ‘culture eats strategy for breakfast’ and of course co-production is a cultural thing not a strategy. Last Friday week I travelled a few miles on the back roads to one of Lisa and my favourite café and shops for a quite historic morning. As I cross the bridge over the A11 from Brandon to Elveden I briefly looked down onto the new dual carriageway and for the first time the cones were cleared and the traffic was using the new Dual Carriageway. The day started early with a business breakfast where Liz Truss MP and members of the Norfolk Chamber of Commerce all talked about the economics benefits to Thetford and beyond and as I listened to the speeches, it struck me it was just as beneficial to West Suffolk and how FHDC are working with Brandon businesses to make sure we get the maximum benefit from this investment too! Next we drove to the Elveden Inn where later in the morning there was the official opening speeches as the Secretary of State for Transport Patrick McLaughlin officially opened the road. It all looked splendid on the telly later in the day but the actual ceremony was slightly surreal as the Highways Agency used a lorry on which the VIPs stood and spoke and the rest of us, due the rain were huddled in a tent where you sort of had to, bend the knees, to see the faces of those speaking. 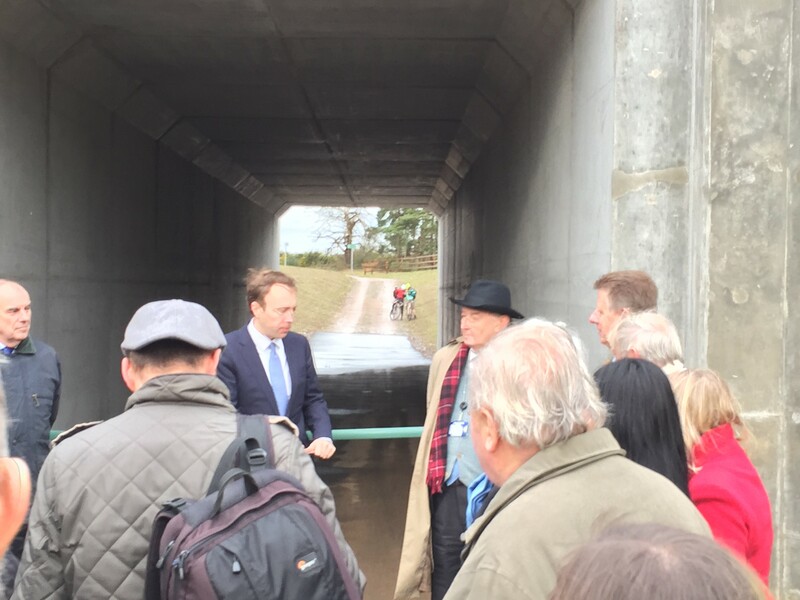 Later the more local of us boarded a bus to go and see the bridleway underpass that Suffolk County Council paid £350,000 for the building of and as Matthew Hancock MP officially opened it he paid tribute to Cllr. Guy McGregor the former Suffolk Cabinet Member for Highways and Transport who was instrumental in the fudging be made available before the underpass to be constructed. Speaking of those instrumental in making the dualling happen, the picture shows Matthew Hancock opening the new bridleway underpass of the new road and thanking Cllr. 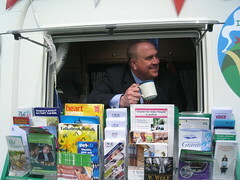 Guy McGregor who when he was Suffolk County Council Cabinet Member for Transport battled for the funding to make it happen as a part of the scheme. The only other key person who could not be there on the day was Lord Risby of Haverhill, Richard Spring MP that was and Matt’s predecessor, but Matt thoughtfully retold one of Richard’s storys about the road, that its dualling was in his maiden Speech in the House of Commons and after 17 years of hard campaigning on his part, was given the green light 3 months after he retired! Having worked with Richard over many years firstly as his Association Deputy Chairman Political and later as his Chairman and then when I was in the cabinet of Suffolk County Council I recall that hard work and he should be proud of the part he played in this magnificence new road that will make such a difference to our part of the world.